Making your exhibition marketing & stand design budgets go further is always useful information to know. Nobody likes paying too much for anything. 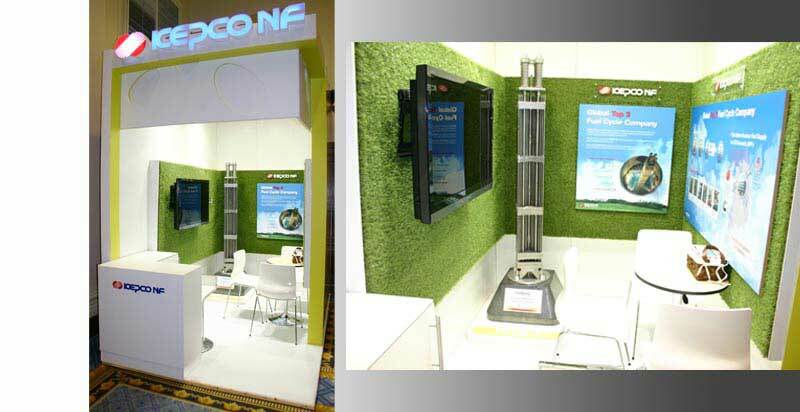 Everybody likes to get the best stand designs and ultimately a ‘Big Bang for their Buck’ as it were at the tradeshow event – with a great exhibition stand installation. 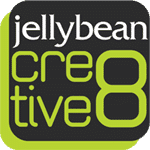 Creativity and value for money is key to making customers marketing & design budgets go further. Put into operation – the following 7 ways will help make your events & trade show marketing budget go further. The easiest tip to making your funds stretch further when planning for your exhibition stand – is to be ahead of time. This means being pro-active and doing everything possible before the show date to maximise the best results. You will save costs on lots of things ranging from your accommodation to the space in which your exhibition booth is to be fitted. Not only this, but it also gives you plenty of time to find the best exhibition stand contractors and construction company to use for your project. 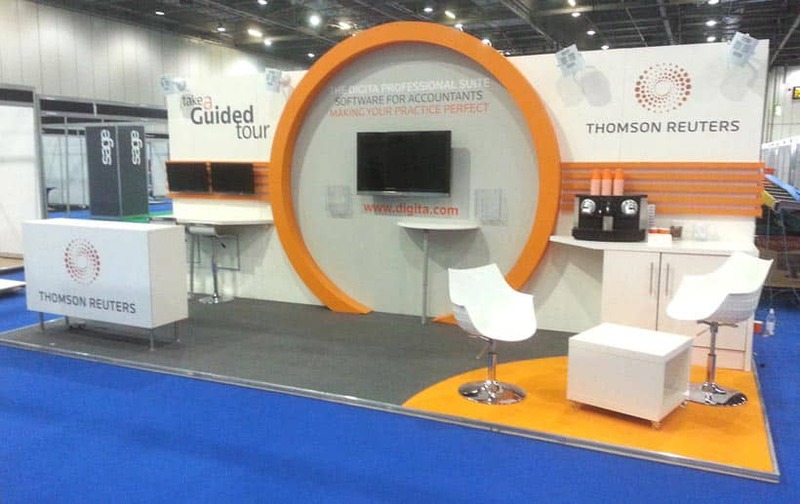 Spending lots on the size of your exhibition stand location isn’t essential. 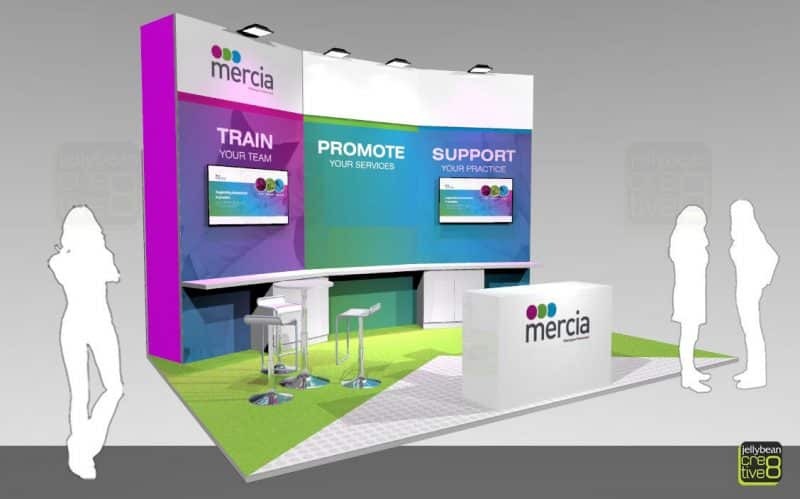 Your exhibition stand designers can still attract lots of attention no matter the size of your stand. You can draw lots of attention to your company by simply using the area you have. You can add banners, hanging signs or displays. You do not have to pay any extra for the room above your stand so by setting up hovering logos or products; you will not only cut the costs of your stands (location wise) but also attract people’s attention from far away. Some companies make the big mistake of filling their stand space with too many products. They assume by displaying their full range of products and detail every service they supply – that customers will be impressed. Show grounds and exhibition halls can be very busy places. From every angle there is a forest of visual messages and this can be quite overwhelming. By ‘bucking the trend’ by not filling the stand area to its maximum with products, you can use the space for more interesting and eye catching things like: Stunning graphic design, Moving AV images or engaging videos, etc. This means when visitors arrive at your stand they won’t just see products however will quickly understand the benefits from your stand and will be engaged with the exhibition booths message. This is handy as it will save costs on shipment of your products and transport. Once you’ve booked your stand space – don’t ignore the event organiser. Make a friend of him or her. Try to work with them not against them and see if they could help you raise your pre-show marketing exposure, for example – by sharing information about your company, products and services. This will allow you to connect and engage with their audience. By using hash tags and various other methods you will be able to promote your booth and services prior to the event taking places. When possible you could try to book a mentoring slot, allowing a representative from your company to be one of the speakers at the show. This will raise your profile at the event, promoting you as an expert in your chosen industry sector. Maybe other kinds of promotions or demonstrations will be possible, allowing you to utilise other areas of the show ground to promote your brands and services. Attracting attention to your exhibition stall is a key requirement at the trade show event. Using marketing tools like games or interactive items will for sure raise the costs of your stand. However, this is not a bad investment – as it will draw the attention of visitors to your booth. Not only will these draw visitors in but if you position the engagement tools around your stand, you will encourage customers to explore your stand and commit to passing over the line onto your stand. These can also capture your visitor’s details and get permission to future email promotion and newsletters. Lots of companies will have busy periods with lots of visitors entering the stand. However, they may have slow periods. When having a slow period, ensure your exhibition sales staff utilise their time wisely. This may involve targeting other possible clients exhibiting at the event. Other exhibitors are your potential clients. Therefore do not waste this opportunity in either selling to them or negotiating possible profitable collaborations. By forming alliances with other exhibitors – this allows you to add value to your companies offering. You can promote other exhibitors who add value to your company, and vice versa – they can promote your services also. You in effect create additional sales people at the show for your company. By taking along to the show additional self-standing business card holders or brochure displays – these could be placed on other exhibitors booths by prior negotiation. 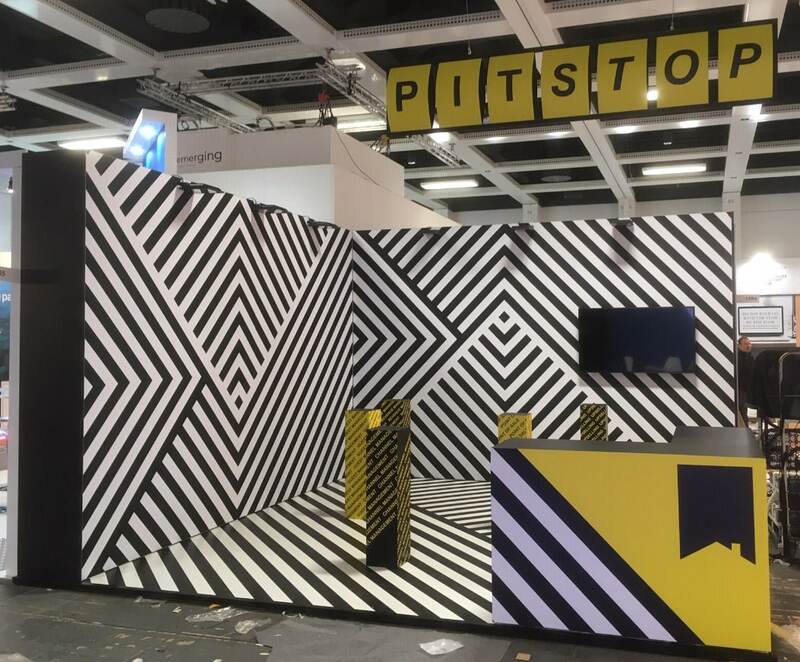 If you don’t exhibit often, then hiring elements of your stand might be the way forward as it will avoid large construction projects and expensive installations. It will also avoid the cost associated with keeping items safe and in storage – which may be linked with the builders quotation of the custom exhibition stands. By combining small bespoke made displays with some hired in display elements – the overall exhibition costs can be reduced. This will allow your marketing budgets to go further – without sacrificing the overall quality of your exhibition stand designs. 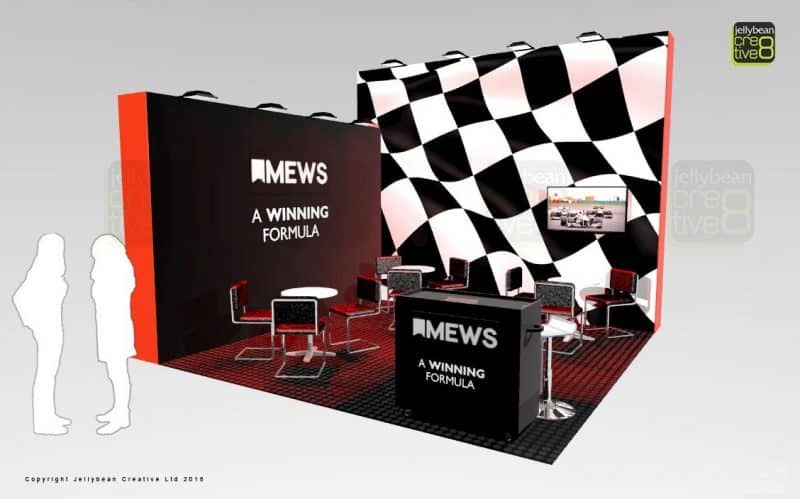 Custom exhibition stand designs with a motorsport theme. Client wanted the stand to look like a racing Pit Stop with tool cabinets for the reception point.